Jan loves the "Theater." After spending the summer before her senior year in High School ACTING in a professional stock company, she's crushed when she loses the lead in her school's play to some new girl, Kerry. Even worse, Jan is forced to coach Kerry in the part. But, instead of hating Kerry, Jan realizes she's falling in love with her. Kerry is falling for Jan, too. But what are they going to do about the hate and prejudice of others? 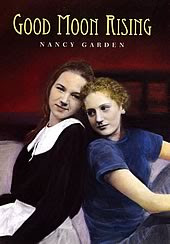 "Good Moon Rising" won The 1996 Lambda Literary Award for best YA book with GLBTQ content! While the original Farrar, Straus edition of this book is out of print, so many fans asked for it that Nancy took advantage of the Authors Guild "backinprint program" and copies are once again available. Add your review of "Good Moon Rising" in comments!